Garlic is grown in a lot of parts of the world and is a popular ingredient in cooking due to its delicious taste and strong smell. Garlic is a simple ingredient with amazing health benefits. It is a sulphurous compound, and usually a stronger tasting clove has more sulphur content, and hence, a more potential medicinal value. Many people suggest that organically grown garlic tends towards a higher sulphur level and thus, a greater benefit to health. Whether or not it is the case, it undoubtedly possesses the best taste. Garlic is certainly one of the best plants to grow at home. It’s easy and inexpensive.Did you know that eating a whole head of garlic a day does miracles for your body? Folk medicine believes garlic to be able to cure almost everything, from the common cold and flu to plague! Garlic is composed of nitrogenous substances, selenium, calcium, magnesium, extractives, sodium, silicon, sulfuric, phosphoric acid, vitamin C, D, B, phytosterols, potassium, and essential oils. Moreover, garlic is rich in phytoncides, such as allicin, which is formed by the mechanical destruction of plants, that is – crushing or grinding cloves of garlic. Some researchers claim that allicin has a strong bacteriostatic effect which helps cure infections faster. Garlic is a much more valuable medicine than that of many of today’s antibiotics, since it can also fight fungal infections. • To start growing garlic indoors you need one good garlic head only. • Put some potting soil in a large pot. Break garlic cloves apart and sow each clove vertically into the soil at a depth of 1 inch.Cover all the cloves with soil. There should be about 1 inch of soil over all the cloves. • Find a place for the pot which gets plenty of direct sunlight. • The procedure is the same as when growing any indoor plant, keep an eye on the soil and water it when it starts to dry out. • Clip off the greens when they are about 3 – 4 inches tall. Leave about an inch for it to re-grow. Eventually, the greens will stop growing. 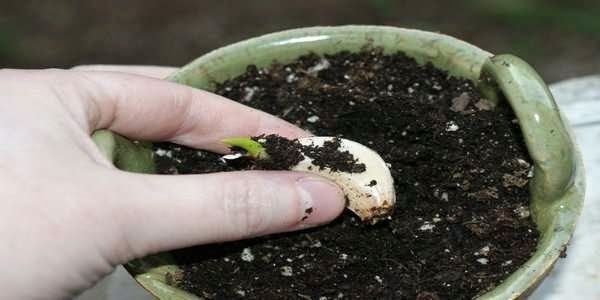 • When the garlic turns brown and dries up, dig the clove of garlic you planted and you should have a full bulb. Take a clove and start over again!